Comments: In 1924, Masonic Lodge #45 laid the cornerstone for Scottsville's new school on West Main Street. 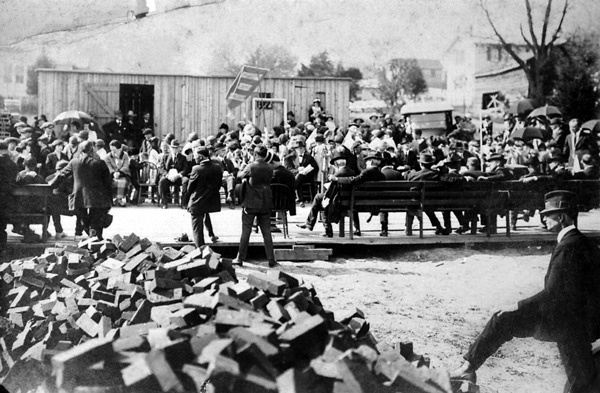 Pictured with his foot on the brick pile in the left forefront of above photo is Arthur Thacker, father of Scottsville's Mayor Raymon Thacker. 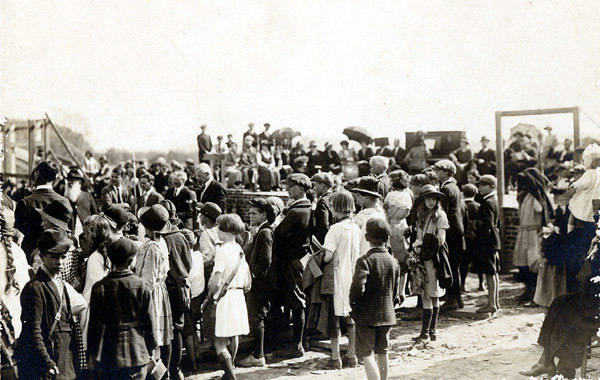 Shown below is another scene from the cornerstone laying ceremony, which many Scottsville citizens attended. 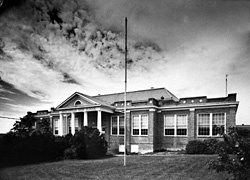 When completed in 1925 as shown at left, Scottsville School housed all grades from third through high school until 1967 when it became a junior high and elementary school combined. In 1968, Scottsville high school students began attending Albemarle High in Charlottesville. The Leslie Walton Middle School, located halfway between Scottsville and Charlottesville, opened in 1974. The new Scottsville Elementary School, just north of town on Route 20, opened in the fall of 1979 for grades K-5.